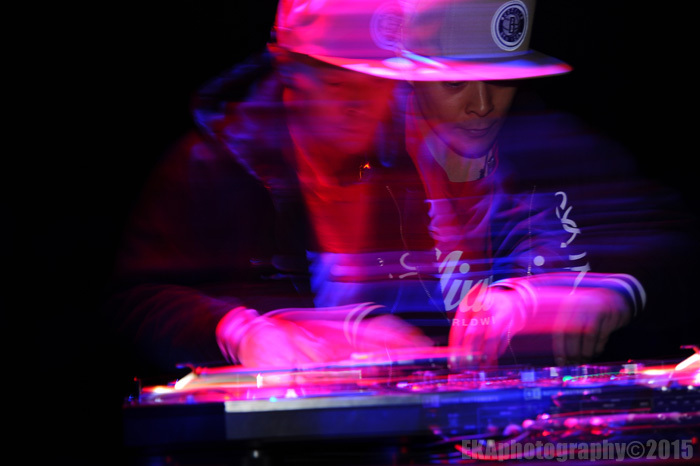 Is DJ Q-Bert human ?!?!?!? We’re not sure. After witnessing his killer solo DJ performance at the New Parish, it’s quite possible that “Q” is an alien extraterrestrial being. 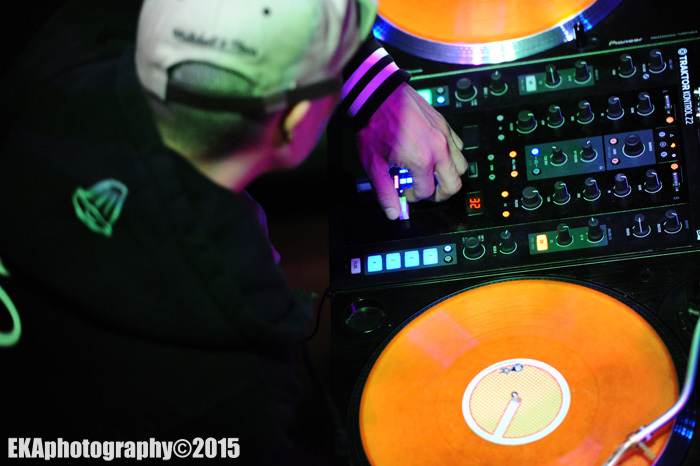 No other scratch DJ has skills like him. No one even comes close, really. Whether crabbing, transforming, beat-juggling, flaring, or power-scratching, Q-Bert has all the techniques down. Which is unsurprising, since he invented many of them. His scratch factor is well above 100%, possibly over 200%. It’s hard to think of a more capable scratchmaster, or one who could make all that tricky wikki-wikki-wikki stuff seem as easy. 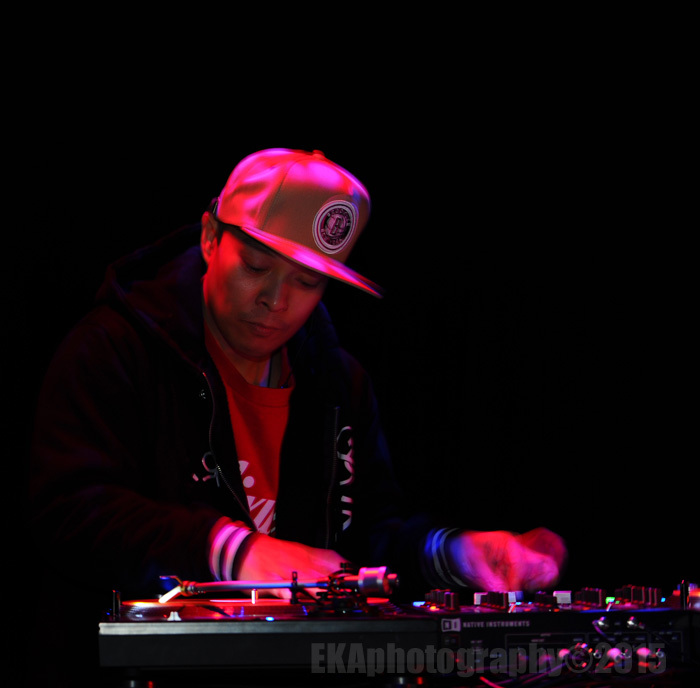 A founding member of legendary turntable crew Invisibl Skratch Picklz and three-time DMC World Champion, QBert has had a remarkable career. 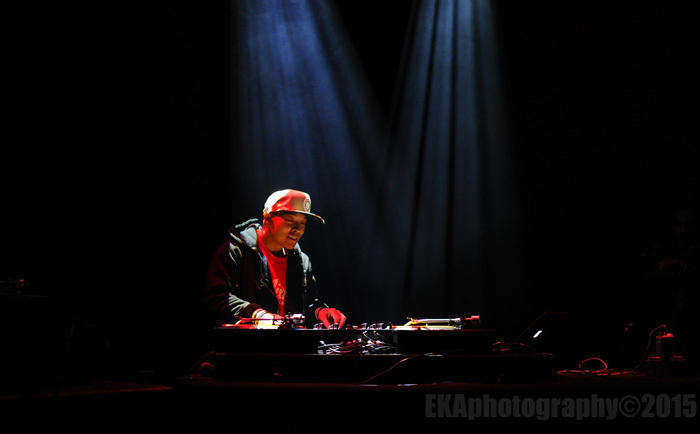 His 1997 solo album Wave Twisters is widely regarded as the Kind of Blue of turntablist albums, and his contributions to the Doctor Octagon project with Dan the Automator and Kool Keith helped to create a new model for alternative hip-hop. 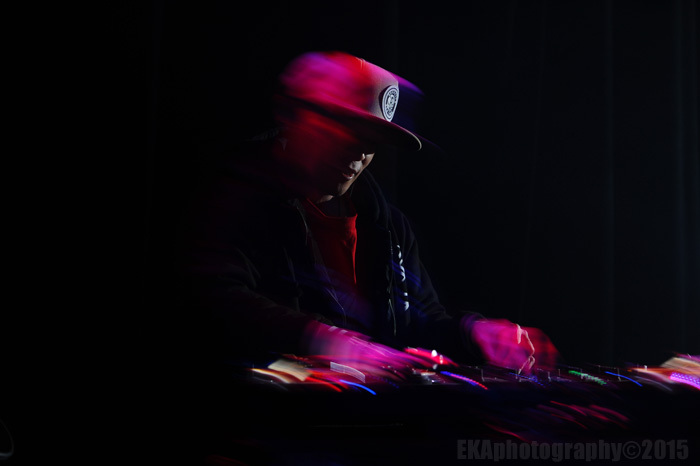 Over the years, he’s made animated movies, put out a series of breakbeat albums specifically designed for turntablists, been featured in the documentaries “Scratch” and “Hang the DJ,” contributed to video game soundtracks, established an online “skratch” university, collaborated with artists such as Run the Jewels and Bambu, and recently released his crowdfunded second (double) album, Extraterrestria/GalaXXXian — Kickstarter’s most-successful hip-hop project ever, according to Q’s website. The coolest thing about watching Q rock a club live is just how innovative and creative he is. His set didn’t depend on predetermined routines, but rather was mostly improvisational, with a difficulty factor higher than 10.0 on some of the things he tried. He didn’t have an excess amount of gear and add-ons, like some of the “superstar” DJs you’ll hear today, who rely a lot on electronic gimmickry and cue-pointed loops. Remaining true to his b-boy heritage, Q keeps it old-school and relies on his hands, mostly. About the only concession to contemporary technology he made was the use of vinyl emulation software and a laptop computer. 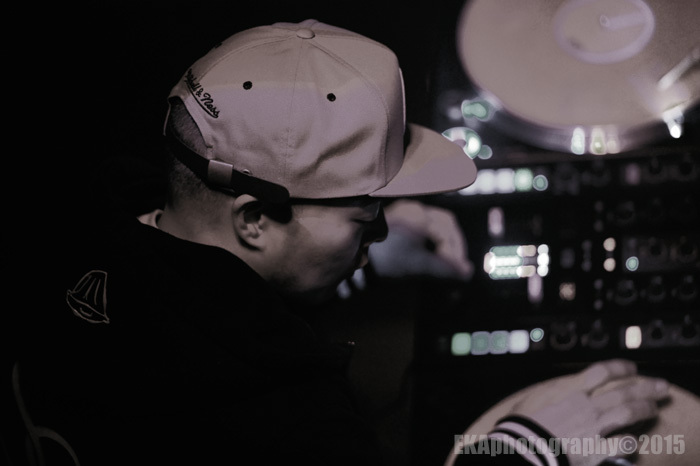 Q’s aesthetic essentially revolved around the same core principles as it did in the early 90s, when he first burst on the scene: turntables, mixer, and a whole lot of scratching over break records. One standout moment came when Q took a break made up entirely of two tonal notes from the Art of Noise’s “Moments in Love” and made an entire musical composition out of deconstructing those tones and flipping them in interesting ways, with ever-changing scratch patterns. And boy, does he have his scratch patterns dialed up. Watching Q scratch is like watching Picasso paint. That’s another thing about Q. For such an accomplished scratch soloist, he’s also quite good at party-rocking. He’s not so technical that his sets are boring, like some turntablists out there. Or, rather, he’s extremely technical but also skilled at evoking a feel and creating an emotionally-resonant vibe with what he plays. In other words, he’s funky as hell and knows how to rock, rock on. Frequently, Q changed the tempo and pitch of the rhythm, adapting his scratch technique accordingly, and keeping things interesting from an audience perspective. On the fader, he’s got killer crossovers like Steph Curry or Tim Hardaway. And even when he ventured into techno/electro mode, he kept his aesthetic pure and minimalist. He didn’t go for clichéd, contrived “builds” like some of the EDM wankers out there, but rather maintained a more organic vibe throughout his set, which had plenty of “thudrumble” (to paraphrase the name of Q’s management company). The bass was so loud, beer bottles were shaking fiercely on the tables in the upstairs VIP room. It was that kind of night. 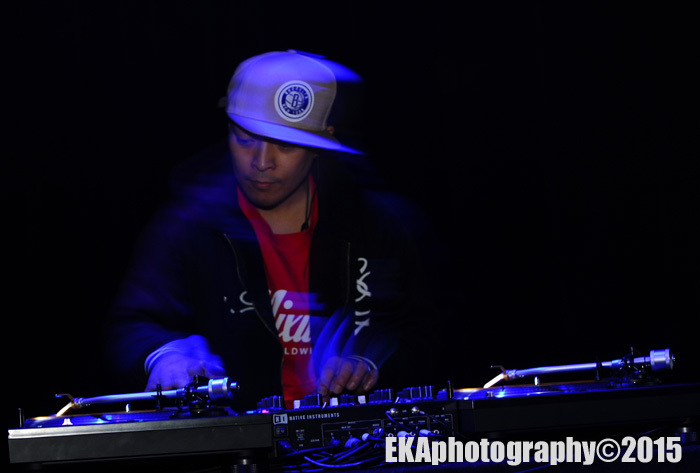 The crowd was fortunate to get to witness one of the true masters of the DJ art form, a man who has done as much as anyone to advance the turntablist cause, and hasn’t sold out by becoming a festival circuit act or a resident at a Vegas casino. About the only downside to the show was that it wasn’t filled to capacity. While it would have been nice if a larger crowd had attended, I’m not sure if that’s because of a lack of promotion, or just the fact that Q, who never played out much, even in his 90s heyday, is somewhat unknown to today’s fans of DJ music. Still, those lucky enough to see the show essentially witnessed an onstage dissertation/deconstruction of DJing and demonstration of hip-hop turntablism at its finest by one of the acknowledged icons of the genre. It doesn’t get much better than that. 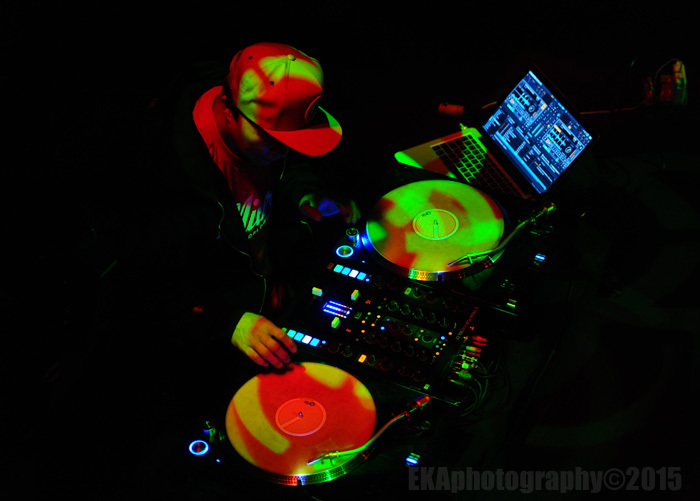 Categories: Live review | Tags: Bambu, DJ Q Bert, Doctor Octagon, Extraterrestria, GalaXXXian, Invisibl Skratch Picklz, Run the Jewels, scratching, ThudRumble, turntablism, Wave Twisters | Permalink.